In our family, road trips mean exploring bookstores. So, naturally, our holiday travels meant time to discover new resources for children of all ages. I know many of the books I share with you are appropriate for elementary-age readers, but I long-ago learned that picture books are not just for children. In fact, I often use them with graduate students. So if you teach older students, read on. 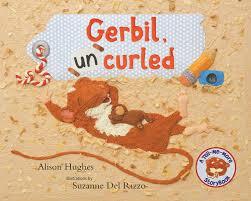 Alison Hughes’ wonderful Gerbil Uncurled explores the dilemma of societal rules that don’t work for everyone. Little Gerbil lives in a world in which the rules are clear. The gerbil community is guided by a set of important Gerbil Mottos, passed down from Grandpa Gerbil. These include essential learnings such as “Always keep your whiskers clean” and “When sleeping, always curl up nose to toes.” The problem is, Little Gerbil can’t manage to sleep curled up. When she tries, she can’t sleep–or she relaxes and ends up stretched out and comfortable. Little Gerbil tries hard to follow the mottos, but in the end bravely brings her dilemma to the weekly Gerbil Circle. She simply can’t sleep nose to toes. Not surprisingly, the group finds she is not the only gerbil who has trouble with some of the rules, just the first with enough courage to admit it. They end up examining the rules, keeping some and adapting others, so the mottos better meet the needs of all gerbils. Gerbil Uncurled offers a fine opportunity to talk about rules, why they can be difficult, and the circumstances in which they should be challenged. Little Gerbil is a good example of risk taking and successful negotiation within a community, both essential skills for creative successes. Her dilemma can be discussed with students from early grades to adulthood. Who, after all, doesn’t need to think about rules, conformity, rule-breaking, and community? Lots to think about from one small gerbil. « Fairy Doors and Creative Kits: Who Gets to Be Creative?